The characters in Crazy Rich Asians are not your regular rich folks. They are next-level, unreasonably, preposterously wealthy. They have bachelor parties on tricked-out container ships in the middle of the ocean. They not only rent out the Marina Bay Sands rooftop, they also hire the national synchronised swimming team to perform in its infinity pool. They own mansions, Bugattis, and gems the size of small pets. The film, out tomorrow, is the first major Hollywood project since The Joy Luck Club, in 1993, with an all-Asian or Asian-American cast. 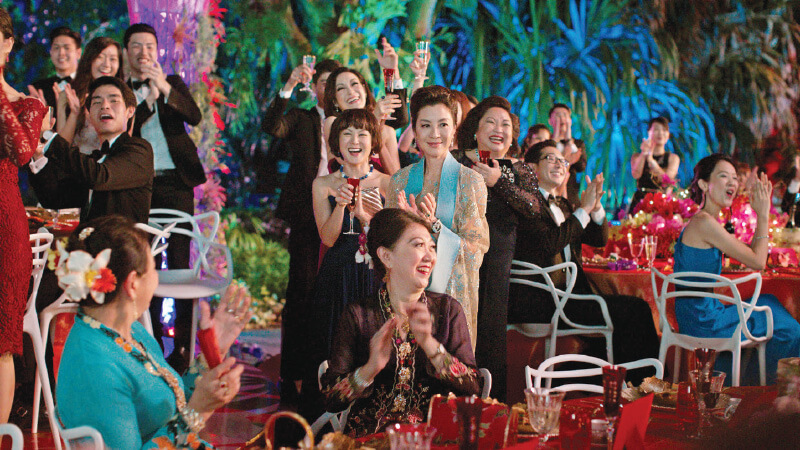 It is based on a 2013 novel by Kevin Kwan that sent up the absurd opulence available in Singapore and how differently the divided factions of its upper class behave. In the book and the movie, old money is represented by the Young clan, who accumulated their fortune from a real estate empire dating to the colonial era. They expect respect. It is a view familiar to many who, like me, are from there. Although my family was not rich, my mother loved to take tea at 4pm at the Raffles Hotel on special occasions. Every once in a while, I would catch the occasional vintage Rolls-Royce cruising down one of the city’s immaculately clean streets. My parents still spin tales of lavish galas from the late 1960s, after independence but before the skyscrapers. Fifty years later, Singapore is a poster child for wealth in Southeast Asia. What began as a trading port and shipping hub has become a global financial capital, thanks to a torrent of investment in its banking industry, now the fourth-most competitive worldwide, according to the Global Financial Centres Index, which surveys international business leaders. This newer money is represented by many of the other characters, such as Rachel’s best friend, Goh Peik Lin (played by Ocean’s 8 breakout star Awkwafina), her flashy family, and the gossiping, ladder-climbing crew of socialites who make up this particular upper crust of society. Some spots transcend the generational divide. Bustling Hermès and Cartier boutiques flank Orchard Road, a commercial thoroughfare that attracts tourists and well-heeled shoppers. The city’s food scene caters to a high-end diner: 39 Michelin-starred restaurants cover almost every cuisine. At the two-star omakase temple Shoukouwa, chefs promise to “caress your palate in elegant finesse”. Odette, in the National Gallery, has an ever-changing S$300 (RM892) tasting menu featuring dishes such as pigeon roasted with hay and foie gras from Rouilly, France. The wedding ceremony takes place at Chijmes, in the Caldwell House, built in 1840 and one of the oldest structures in Singapore. But for an after-party following the reception at the Supertree Grove, the whole squad heads to the observation deck of the Marina Bay Sands. (A fireworks display concludes the revelry.) In another scene there’s a DJ booth made out of the front of a Rolls-Royce. Now consider this: In real life, Singapore meticulously manages quotas on the number of private vehicles allowed on the island, updating the limit every three months and charging onerous fees and taxes. Car owners pay tens of thousands of dollars just to get a certificate, which are sold off at a monthly auction. It is one of the most expensive places in the world to buy a vehicle. Still, there is enough ultra-luxury thirst that Lamborghini, which opened a showroom here in June, has already collected 40 orders for the new US$200,000 (RM818,000) Urus. To attract attention to the opening, the carmaker held an elaborate, 120-supercar-long parade. In Singapore, the latest styles are available at luxury malls such as the new Ion Orchard or Mandarin Gallery, where you can buy a US$5,000 velvet dress from French label Saint Laurent or a US$6,100 cashmere bomber from Loro Piana. Michelle Yeoh, in her role as Nick Young’s tiger mother, pulls off this polish. She wears Carolina Herrera and Elie Saab and classical brooches and earrings that look like they were once owned by royalty. “Michelle said this character would never wear fashion jewellery, she would only wear real jewellery,” Vogt says. “Fortunately, Michelle has her own very beautiful jewellery collection, and she lent us a few pieces.” One such item was a stupefying emerald ring — Chu describes it as just “a big freakin’ ring” — that plays a key role in the story. The most stylish of the set is Nick’s empathetic cousin Astrid (Gemma Chan). Her character wears a sleek pink Alexander McQueen dress to the big wedding, buys a Rolex Daytona for her boyfriend, and hides boxes of Dior around her apartment. But she would also grab a Gap tee at the thrift shop, says Vogt. Spoiler alert: The centrepiece of the film’s fashion was not brand name at all. When the bride walks down the aisle, she is wearing a custom dress created by Vogt. Sewn in Kuala Lumpur by a local dressmaker, it is a gold-beaded concoction with flowing layers of pink and white.